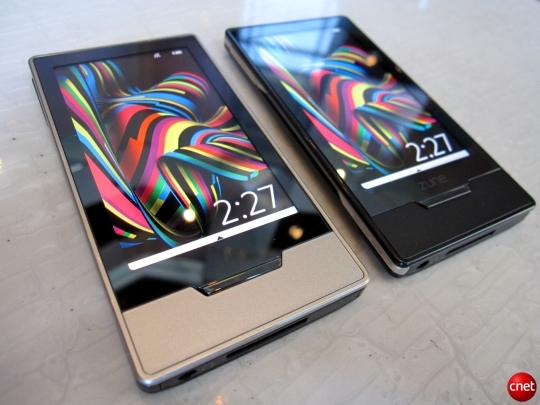 CNet had a look at the Zune HD last Thursday. The mood seems generally positive. The Zune's coolest music trick, though, is that it automatically pulls in a gallery of band photos, biographical information, and similar artist recommendations for any currently playing song--regardless of whether the track is from Zune Marketplace, your friend's hard drive, or torrents. It's feels a little more like digging through Last.fm now, instead of just a straight-up music directory. If the Zune's connected to Wi-Fi, listings of related artists will link though to the mobile version of Zune Marketplace, where tracks can be streamed and purchased directly. Speaking of Wi-Fi, the Zune's new Web browser smokes. Not since first using the iPhone have I been this impressed with a mobile Web browser. There's no branding on the browser, but I was told it was cooked up by Microsoft's Internet Explorer team (makes sense). Page load was snappy, and pinching and reorienting pages work just like the iPhone and iPod Touch. You also get a fast onscreen keyboard with a nice little magnifier effect with each keystroke. But the real innovation seems to be going on in user interface--how do you make a touch screen workable on such a small device? Here, Microsoft has done a solid job, taking the mixture of horizontal and vertical menus used on the current Zunes and adding particular tweaks for the touch screen. You can scroll horizontally or vertically simply by swiping your finger along, and there are multiple "ways in" to and "ways out" of the various menus and screens, which encourages exploration. When a song's playing, you control the volume by touching the screen and hitting a little plus or minus button; numbers show you absolute volume. Clearly marked "exit" buttons are usually available to get you back to the previous menu, and a physical button below the screen (you can see the black trapezoid shape on the screenshots here) takes you back to the home menu page. There was a bit of a learning curve, but after a couple minutes I was impressed by how much functionality Microsoft was able to pack into such a small screen. Hopefully Windows Mobile 7 will pick up on some of the nicer featuers of the Zune HD.